The Lobster Mushroom might be one of the strangest organisms people like to eat! 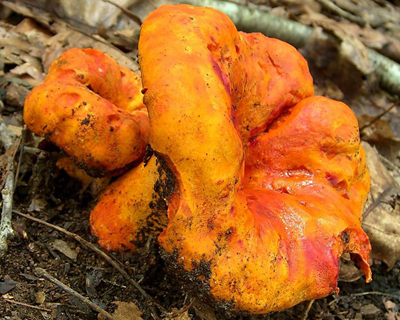 This bizarre fungus goes by the Latin name Hypomyces lactifluorum, and earns its name from its scent and flavor. This species is actually a parasitic fungus that attacks the fruiting bodies of other fungi such as Lactarius and Russulas, especially Russula brevipes. In an act resembling the plot of a science fiction movie, the spores of the lobster land on and transform these mushrooms into brilliant orange, upside down cones that only vaguely resemble their original host. This transformation turns the original mushroom, once the reproductive fruiting body of another organism into the lobster mushrooms own reproductive fruiting body. Not only does the physical appearance change, but so does the smell and taste. Where the original mushroom, Russula brevipes, would hardly be called palatable, this new mushroom is strong flavored and well-loved. It smells strongly of seafood, most resembling the scent of lobster which when not overcooked can also be experienced in its flavor. Identifying features include: being orange to reddish-orange colored on the outside with white colored flesh on the inside; a seafood aroma; a deformed cap that is sometimes cracked that resembles a vessel or upside-down pyramid; no gills - blunt ridges with tiny pimples instead of gills; and grows in the fall, typically after rains. 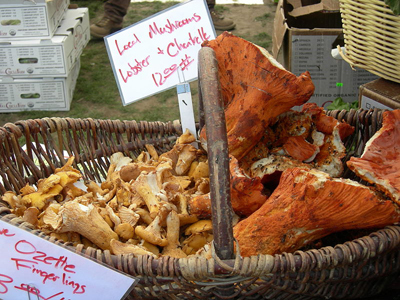 Lobster mushrooms are found in woods and forests across the USA. They are especially likely under hemlock trees, and usually appear in September or October. They may grow singly, in pairs or in clusters. They often lift up dirt as they grow out of the soil, and may require some cleaning. Specimens with white mold should be discarded. This mushroom is best cooked lightly in butter or oil, to preserve its unique flavor. If cooked with strong tasting foods such as onions or garlic, the subtle flavor will likely be overwhelmed. There are some sources that say there may be some concern regarding this species parasitizing a poisonous mushroom, and making it a potentially dangerous wild edible. There has been little evidence to support this claim. Although as with all wild edibles, approach this mushroom with caution the first time as everyone's body is different. Eat a little bit of the mushroom at a time and see how you feel. When collecting, practice good harvesting ethics and take no more than one out of every three or four mushrooms. This leaves more for others, including non-human mushroom eaters as well as allows some of them to be left to reproduce for future years. Non-human mushroom eaters such as deer, bears and squirrels help move spores to new locations. Therefore, over-harvesting not only takes away food from these creatures, but limits this mushroom spreading to new areas. When taking them, first gently pull back the duff around them. Cut them as low along the stem as you can, but try not to just pull them from the ground. The mycelium that connects them to the soil should be left in place whenever possible. Once cut, clean them with a dry brush. Washing mushrooms will make them absorb water, which makes them soggy. If washing is required, dry-saute them in a pan on low to cook the water off. This mushroom is best cooked after being cut in small pieces. 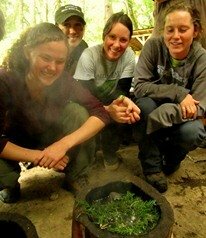 Check out our Wild Mushroom Identification Class to learn more about foraging and consuming wild edible mushrooms. View lobster mushroom recipes at SpecialtyProduce.com.